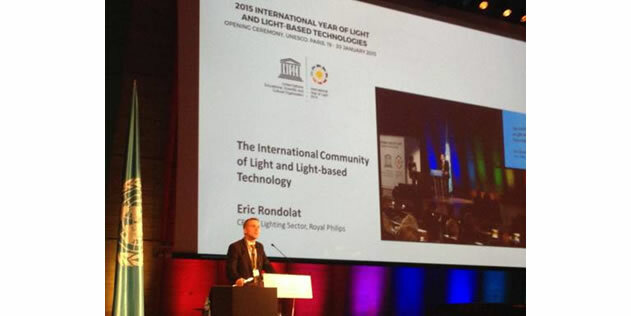 On Monday January 19th,2015, The International Year of Light 2015 was officially launched at the UNESCO Headquarter in Paris,France. During the Opening Ceremony, Philips Lighting CEO, Eric Rondolat, who was one of the speakers announced that Philips Lighting guarantees to help end light poverty. He said "We need to end light poverty for 1.3 billion people by 2030… Cutting Light Poverty is the most socio-economic thing to do". Eric Rondolat also talked about how solar powered LED light is a replacement to kerosene. More than 1.3 billion people are put in light poverty as they cannot adopt electricity. Most of those affected have to use kerosene lamps and candles to light their homes and businesses. But these old light sources take away the lives of 1.5 million people every year through breathing illnesses and fires – the same number killed annually by HIV-related diseases. Light poverty affects wide scope of Africa, Asia and South America with as few as 1.5% of people in South Sudan used electric light. In many developing countries, electrical grids are not available due to the geographic and financial burdens of linking hundreds of remote communities. However, solar LED technology can provide light at a little of the cost of running kerosene lamps, without any of the health, safety or environmental dangers – or the need for major investment in infrastructure. A single solar-powered LED lantern uses zero energy and can fill a room with clean, electric light for a one-off cost of $10-20 (￡7-14), compared to the $50 (￡33) annual fuel bill of running a kerosene lamp. On a larger scale, energy efficient LED lights and solar panels can be combined to produce sustainable lighting in public places and bring areas to life in the night time. These Community Light Centers (CLCs) allow healthcare services and businesses to operate after sunset as well as encouraging sports and other social activities. 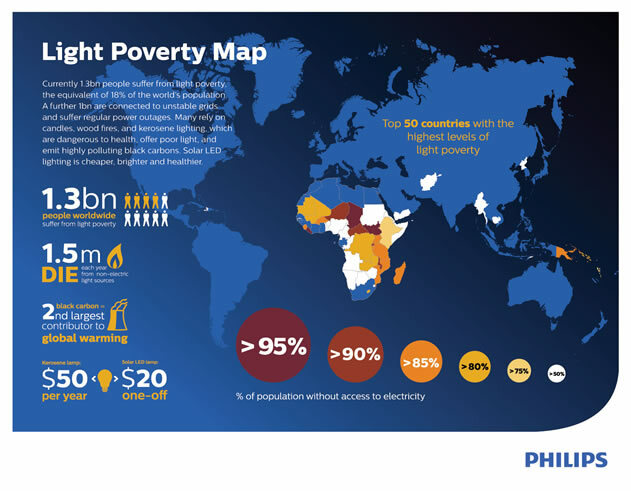 Philips is in the process of installing 100 CLCs across 12 countries in Africa, where some 500 million people do not use light. The Philips Gift of Light program – an employee engagement program in which Philips employees selected and voted for worthy projects deserving of a Philips gift of light made up of lighting products and services. During the coming months, further projects will be implemented by Philips employees in 17 countries around the world. Philips Lighting has provided a gift of solar powered LED lights to an off-grid village Bikuku near Kinshasa in the Democratic Republic of Congo where 1600 people did not use electric lights. The donation provides light after dark to homes, businesses and a Community Light Centre (CLC). CLCs allow healthcare services and businesses to operate after sunset as well as encourage sports and other social activities. Philips is in the process of installing 100 CLCs across 12 countries in Africa, where some 500 million people do not have used light. This famous project is part of the Philips Gift of Light program.